We know that the species of the tree that produces our coffee profoundly influences how it tastes. And we know to the point of cliche that the arabica species produces all of the world’s finest coffees. But what about the various botanical varieties of arabica, the coffee equivalents of wine grape varieties like the Cabernets, Chardonnays, Zinfandels, etc. that figure so prominently in the language of wine? Surprisingly, the jury is still out on the impact of variety on the flavor characteristics of coffee. Many in the gourmet crowd feel strongly that variety is of greatest importance in determining cup character and quality. On the other hand, agronomists and their allies tend to argue that variety has little influence on cup character. They generally feel that specialty coffee buyers are snobs carrying on about nothing and complicating their efforts to get farmers to plant more high-yielding, disease-resistant varieties. I think we can make two rather safe observations. First, many of the newer hybrid varieties of arabica, those with some robusta bred into their makeup, tend to be considerably more neutral in the cup than traditional varieties. On the other hand, most traditional varieties are not particularly different or distinctive in flavor. They may produce a better and livelier coffee than the robusta-incorporating hybrids, but few are different-tasting enough to get picked out from a crowd on the cupping table. Some may be old and honored, like Typica, and some are middle-aged and slightly suspect, like Caturra, but other factors like climate, soil and altitude (not to mention processing procedures) tend to prevail over any distinctive influence of variety on flavor. In other words, it is impossible to reliably distinguish between Typica and Caturra on the basis of flavor profile alone unless the samples are from the same crop year and from the same farm or mountainside. And even then it will be a dicey exercise focused on subtle differences that may change from one phase of the harvest to the next. There do appear to be exceptions to this rather drab conclusion, however. Trees from certain native Ethiopian varieties seem to carry aspects of their distinctive lemon and floral tendencies to other parts of the world. This possibility was dramatically confirmed a few years ago by the emergence of the Hacienda Esmeralda Gesha, a variety of Arabica with Ethiopian heritage found growing on Price Peterson’s farm in Panama. The Esmeralda Gesha’s astonishingly different flavor profile almost instantly made it the world’s most prized and expensive coffee. And the Gesha is unmistakably different in cup character from coffees of other, more familiar varieties growing on the Peterson farm. Since then, of course, Gesha has been extensively planted elsewhere. A sample I recently cupped from Costa Rica, presumably from very young trees, showed some of the Esmeralda character, though in a rather muted way. 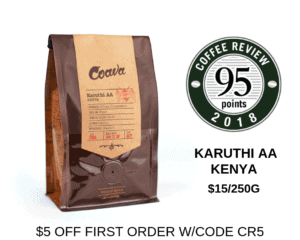 There are other exceptions to the all-traditional-arabica-varieties-(except-some-from-Ethiopia)-tend-to-taste-more-or-less-the-same rule, and three of the most celebrated form the basis of this month’s review: the Bourbon varieties and the great Kenya varieties SL-28 and SL-34. These varieties not only appear to carry some of their distinction with them when they travel, but they also share a similar heritage, given that most coffee botanists consider SL-28 and SL-34 Bourbon types. 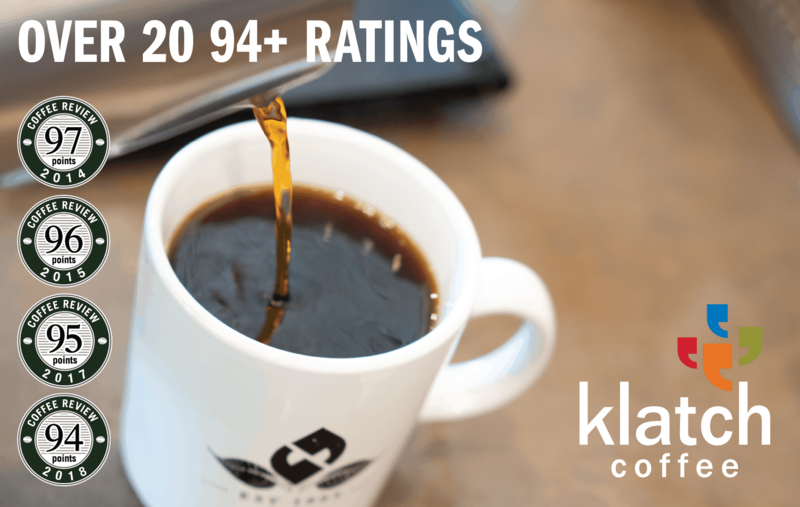 We had two goals for this month’s review: First, find some fine, distinctive coffees for readers to enjoy (Bourbon and SL-28 are good places to look). Second, test, however unscientifically, the hypothesis that there is a Bourbon cup character that carries from geography to geography. Bourbon has a long and rather obscure history. It is a natural mutant of arabica apparently discovered growing on the island of Reunion (then Bourbon) in the Indian Ocean off the coast of Madagascar in the late 18th century. Farmers found it more disease resistant and heavier bearing than other coffee then growing on the island, and it (together with another variety called Leroy Pointu) gradually replaced other coffee varieties grown on the island, along the way adopting the name of the island and developing a reputation for superb cup quality in Europe. Little to no coffee is grown on Reunion today, but Bourbon seeds eventually were carried throughout the coffee world, where they naturalized in new environments. Today strains of Bourbon are still widely grown in Brazil, in parts of Central America, particularly El Salvador, in patches elsewhere in the Americas, and in East and Central Africa, where it was introduced from Reunion in the early 19th century and where it lives on in various natural hybrids and selections like Kenya’s SL-28 and SL-34. Bourbon’s relationship to SL-28 is particularly important to the inner history of coffee, because SL-28, and to a lesser degree SL-34, are responsible in Kenya for what are arguably some of the world’s consistently finest coffees. SL-28 and SL-34 are both selections made by the famous Scot Laboratory (hence SL) that did pioneering coffee development work in Kenya and Tanzania in 1935 through 1939. The various Scot Laboratory selections, all numbered, were not created by artificial cross-pollination, by the way, but were selected from trees collected from throughout East and Central Africa. Those who have studied SL-28’s physical traits suggest that it has Bourbon characteristics as well as characteristics associated with Ethiopian and possible Sudanese coffees, whereas SL-34 appears to be closer to the original Bourbon type. Now to the question of the Bourbon cup profile, or what my co-cupper for this article, Andy Newbom of Barefoot Coffee, irreverently calls “Bourbonosity.” I asked Andy what distinguished “Bourbonosity” for him, and he responded at considerable length and with great vivacity, but the heart of his description was “butterscotch flavor highlighted with sweet lemony citrus.” My own definition follows the same rough trajectory. I think of the quintessential Bourbon note as pungent dry berry with associated hints of lemon and aromatic wood, a little as though one took ripe blackberries, squirted a little lemon juice on them and then nuzzled them on fresh-cut cedar. Some associate the Bourbon note with black currants. The essential notion is a fruity sweetness tempered by a dry pungency. This is not a soda-fountain type of flavor note, by the way. When cuppers carry on about “blueberry” in certain dry-processed Ethiopia coffees, for example, they are describing an aroma and flavor note that literally smells and tastes like fresh blueberries. The Bourbon flavor complex, by comparison, is unique to coffee, appears to be inherent in the bean itself, and for those reasons perhaps, is more deeply treasured by those of us who feel we recognize it. Without exchanging notes during the cupping, Andy and I separately indicated the level of Bourbon character we detected in these coffees, from “a lot,” to “some,” to “none.” Two samples were so darkly roasted we couldn’t tell anything about their green character, but with the others we felt we identified “some” in all samples and “a lot” in about half of them. Finally, here is my trump card, however singular and modest, in regard to the portability of the Bourbon character. This month’s top-rated coffee is a deliberate experiment in testing the capacity for the Bourbon character to cross boundaries and jump oceans without completely losing itself. Encouraged by Miguel Meza, the innovating founder of Paradise Roasters, a farmer in the Ka’u growing district of Hawaii, about thirty miles southeast of Kona, segregated fruit from a patch of about fifty Bourbon trees growing on her farm, carried out the fruit removal and drying carefully using traditional procedures, and submitted the coffee medium-roasted for our cupping. Neither Andy nor I had any idea whose coffee we were tasting or where it came from, but upon cupping this sample we both immediately and secretly concluded that it was a Kenya. In fact, I felt badly for some of the other Bourbons on the table because there was such a great Kenya competing with them. Instead, this striking sample turned out to be a Hawaii coffee unlike any other Hawaii coffee either Andy or I had ever cupped before. “You’ll swear it’s a Kenya. You’ll never guess it’s a Hawaii coffee,” Andy wrote in his notes. And I can vouch that it does not taste at all like the other excellent coffees from trees of the Typical and Caturra varieties growing on Lorie Obra’s farm, coffees that I have cupped on three different occasions over the past two crop years. Of course, Lorie would be the first to point out that this particular small lot of coffee was babied all the way from tree to bag. Everything that coffee people want to happen to a coffee between tree and green bean happened. Lorie picked the coffee herself, so there were no greens or overripe fruit in the mix; she carefully skimmed off immature beans or “floaters”; she removed the fruit from the beans by the traditional method: The fruit pulp was loosened by fermentation (“dry” fermentation without a covering of water) and subsequently washed off. The coffee was sundried in a shallow layer. But meticulous preparation can only make a coffee taste better; it cannot make it taste different. It does not assure the sort of explosive, soaring, clean fruit character that this coffee displayed, which I feel can only be attributed to variety. Of course one small experiment does not conclusively prove anything, particularly with a beverage as perverse and complex as coffee. But it does suggest, as this entire cupping does, that Bourbon and Bourbon-derived varieties are a good place to start when looking for coffees with inherent greatness. 2009 The Coffee Review. All rights reserved. Kenneth Davids is a coffee expert, author and co-founder of Coffee Review. He has been involved with coffee since the early 1970s and has published three books on coffee, including the influential Home Roasting: Romance and Revival, now in its second edition, and Coffee: A Guide to Buying, Brewing and Enjoying, which has sold nearly 250,000 copies over five editions. His workshops and seminars on coffee sourcing, evaluation and communication have been featured at professional coffee meetings on six continents.